The young eagles and their mother were rescued in Bangor this spring, state officials said. Two young bald eaglets were set free Friday along the Kennebec River in Augusta after being rescued from their treetop nest this spring, state wildlife officials said. The eaglets, from Bangor, had been stranded in the nest after one eagle parent died from flying into an electrical line and the other became ill by ingesting a toxin, according to a news release from the Maine Department of Inland Fisheries and Wildlife. The ill eagle mother and the eaglets were rescued because they couldn’t care for themselves, the release said. After their rescue, the eaglets were raised at Avian Haven in Freedom, a nonprofit wildlife rehabilitation center, until they were ready to be released as full-sized healthy, juvenile birds, according to the release. 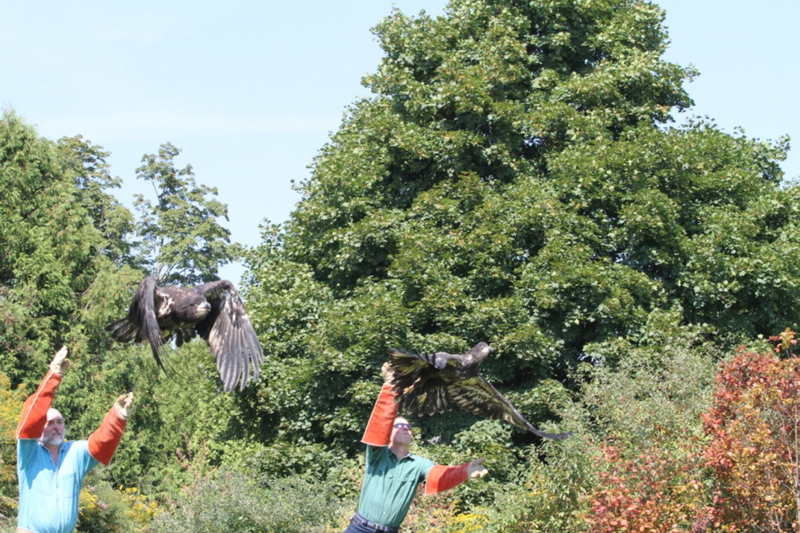 The adult female eagle was nursed back to health and released earlier this summer. On Friday, the eaglets were released by Marc Payne, a founder of Avian Haven, and Brent Bibles, a professor at Unity College.